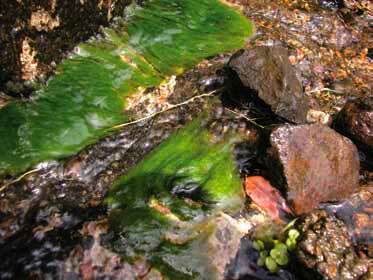 If you have ever walked along a river or stream you have probably noticed a mossy green alage on the rocks. If you try to step on the rocks, it is slippery. 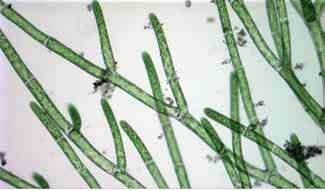 This green, soft algae is referred to as cladophora. Cladophora is also known as "river weed" and in Laos it is even eaten as a delicacy in the form of dry sheets, similar to Japanese nori. Cladophora is a filamentous bloom, meaning it is an algae with longer tendrils. It is often found on rocks in streams or rivers and growing around waterfalls. When viewed under a high power biological microscope, then longer tendrils have multiple fingers that shoot off of each branch.